Eternal Orthodox Church calendar for the 10.10 year 2017. Born in Carthage, he was a Christian from his birth, as his father and grandfather were. One of his forbears, Neochorus, served as a soldier in Jerusalem under Pontius Pilate at the time of the Passion of our Lord and Saviour Jesus Christ. Seeing the many miracles that were wrought at the time of Christ"s death, Neochorus came to believe in Him, and was taught the Faith and baptised by the apostles. Returning home, Neochorus took his Christian faith to his own people, like a precious pearl. 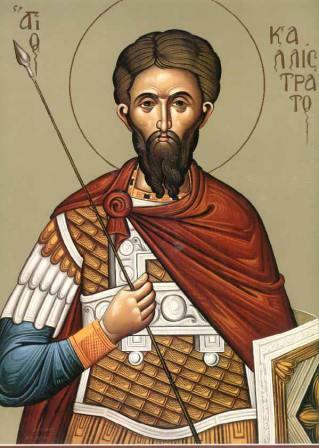 So, in time, St Callistratus was born, baptised and brought up a Christian. When he went into the army, there was no other Christian in his regiment. One of his companions, seeing holy Callistratus get up at night and pray to God, reported him to the commander, Persentinus, as a Christian - and Persentinus was a harsh torturer of Christians. When he was convinced that Callistratus was indeed a Christian, the commander ordered him to offer sacrifice to idols, which Callistratus immediately refused to do. Then Callistratus was harshly beaten and thrown into the sea, but God"s power preserved him, and he emerged from the sea unharmed. Seeing Callistratus"s endurance and his miracles, forty-nine soldiers came to believe in Christ the Lord, and they were beaten and thrown into prison along with him. 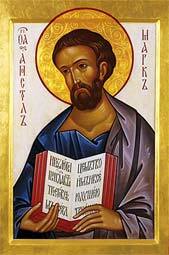 In prison, St Callistratus instructed his companions in the Faith and encouraged them. They showed great courage in suffering, and the Lord showed great power through them. The wicked torturer sent soldiers to the prison at night, and they slew Callistratus and the other forty-nine. They suffered for the truth in 304, and a church was later built over their relics. From the village of Zaklivera in the diocese of Jedrene, she was a girl of eighteen. Her father embraced Islam and put pressure on his daughter to do the same, but her mother inclined her to the Christian faith. After much torture, all wounded and bloodied, she breathed her last in her mother"s arms and received the wreath of martyrdom on September 27th, 1764. The Holy Martyress Epikharia lived at Rome during the reign of Diocletian (284-305). For her steadfast confession of Christ as Saviour they subjected her to tortures: they suspended her and tore at her body with iron hooks, and then they beat at her with tin threshing-rakes. The holy martyress prayed, and an Angel of God struck down the torturers. 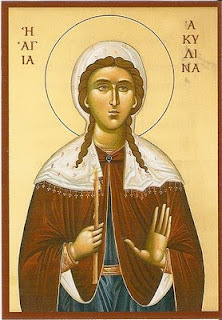 Then Saint Epikharia was beheaded. The Monk Ignatios lived during the X Century in Cappadocia and from his youth was dedicated by his parents to God. Upon attaining the age of maturity, he accepted monasticism and soon was ordained to the dignity of presbyter. Saint Ignatios afterwards was made hegumen of a monastery of the Saviour, called "Deep River", nearby to Constantinople. The Monk Ignatios concerned himself about the monastery, embellishing the churches and making an enclosure for the monastery. 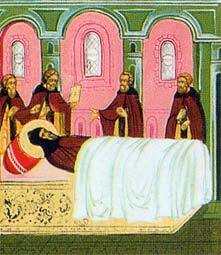 The Monk Ignatios died in the city of Amoreia in the year 975. His relics after a long period of time were uncovered undecayed.